India successfully has test-fired its nuclear capable Agni-V ICBM from the Abdul Kalam island, off the coast of Odisha, on January 18. This 17m long ICBM with a payload of 1.5 tons, can transport a fusion-boosted fission weapon - nuclear device. The Agni-V has been tested five times since 2012, the last one before the current launch being in December 2016. The US, Russia, China and North Korea (despite UN sanctions) had all test-fired ballistic missiles during 2017. The first test of Agni-5 by India was conducted on April 19, 2012, the second on September 15, 2013, the third on January 31, 2015 and fourth trial on December 26, 2016 from the same base. The first two successful flights of Agni-5 in 2012 and 2013 were in open configuration. The third, fourth and today's launch from a canister, integrated with a mobile sophisticated launcher, were in its deliverable configuration that enables launch of the missile with a very short preparation time as compared to an open configuration. The third, fourth and the January 18, 2018 launch from a canister, integrated with a mobile sophisticated launcher, were in its deliverable configuration that enables launch of the missile with a very short preparation time as compared to an open configuration. It also has advantages of higher reliability, longer shelf life, less maintenance and enhanced mobility. India has in its weaponry Agni series, Agni-1 with 700 km range, Agni-2 with 2000 km range, Agni-3 and Agni-4 with 2500 km to more than 3500km range. The January 18 user associate test-flight of the missile has further boosted indigenous missile capabilities and deterrence strength of the country. All radars, tracking systems and range stations monitored the flight performance. The missile travelled for 19 minutes and covered 4,900 km. After four successful developmental trials, this was the first user associate test of Agni-5 missile, which is the most advanced missile in the Agni series with new technologies incorporated in it in terms of navigation and guidance, warhead and engine. It has a range of over 5000 km. The high speed on board computer and fault tolerant software along with robust and reliable bus guided the missile flawlessly. The redundant Navigation systems, very high accuracy Ring Laser Gyro based Inertial Navigation System (RINS) and the most modern and accurate Micro Navigation System (MINS) had ensured the missile reached the target point within few metres of accuracy. The missile is so programmed that after reaching the peak of its trajectory it will turn towards Earth to continue its journey towards the intended target with an increased speed due to the attraction of the earth's gravitational pull. Its path is precisely directed by the advanced on-board computer and inertial navigation system. According to the Federation o American Scientists, India is believed to have some 120-130 warheads compared to several thousands of the US. 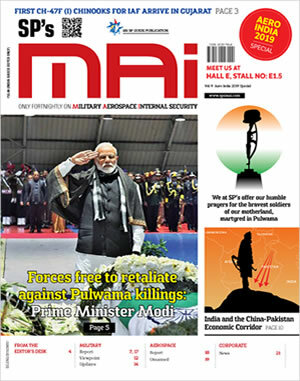 Significantly, the January 18 launch coincided with Israeli Prime Minister Benjamin Netanyahu's state visit to India and during the Raisina Dialogue 2018. In fact, confirmation of the successful test came during a panel titled 'Nuclear Unpredictability: Managing the Global Nuclear Framework' of the Raisina Dialogue. Coming after four previous tests, the January 18 firing of the Agni-V takes India closer to incorporating the missile into its Strategic Forces Command. Once the induction process is complete, India will join an elite group of countries possessing ICBMs, including US, Russia, China, France and Israel. China has always been critical of India's missile program. Du Wenlong from the Chinese Academy of Military Science had told Global Times earlier that the Agni-V had a strike range of about 5,000 miles (8,000 km), rather than 3,000 miles (4,8000 km), and that the Indian government had deliberately played down its range to avoid causing concern to other countries. India is working on enhancing the range of Agni-V and is also engaged in the development of Agni-VI. China's CSS-10 Mod 2 ICBM has a range in excess of 11,200 km and according to the US Department of Defence (DoD), the Peoples' Liberation Army Rocket Force (PLARF) is continuing to enhance its silo-based ICBMs and is adding more survivable, mobile delivery systems. According to them, China is estimated to possess 75-100 numbers of ICBMs, 50-75 launchers that can fire the missiles to a range of 5,400-13,000+ km. Development continues of the road-mobile DF-41 ICBM, which the report says is (multiple independently targeted re-entry) "MIRV capable" (targeting multiple targets) like the existing silo-based DF-5B. The DF-41 ICBM, the development of which is expected to be complete this year, will carry up to 10 manoeuvrable nuclear warheads each weighing 100 to 200 KT to a megaton size. The expected range of the missile is between 12,000- 15,000km, and thus, will be capable of reaching every corner of the Earth. But India's Agni-V already has entire Asia and almost 70% Europe within its striking range. India has arrived on the global scene as a missile power.